Sittler has been designing and building equipment for over 35 years. Our windrow turners, compost/lime spreaders, trommel screens and baggers are built to fit the growing need for efficient nutrient recovery and distribution in agriculture, industries and municipalities. We offer a new alternative to waste management. Using our compost equipment saves time and money. Compost is mixed consistently, locking in odours, allowing raw waste to be converted to humus rich top soil in 6-10 weeks. Ideal for recycling manure, sewage sludge, paper products, animal carcasses, food scraps, leaves, grass, tree limbs, and the bioremediation of contaminated soil. Sittler's manufacturing has over 25+ years experience designing and manufacturing compost equipment. That�s experience you can count on. Sittler designs have evolved with diligent research and development to meet the growing needs of the compost market and to provide the most practical affordable efficient windrow turners available. 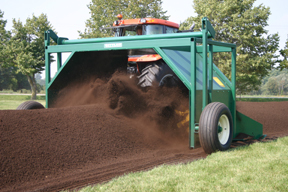 Our machines are designed and manufactured so the end user will make the highest quality compost from agricultural, industrial or municipal waste. That is why they are recommended over any other make by Dr. Elaine Ingham, founder/president of Soil Foodweb Inc., for having the best performance of any windrow turner on the market. "Having used Sittler turners for the past thirteen years I can say, without reservation, that Sittler's are the best machine for the money on the market today. Over the years I have purchased six (6) Sittlers and have one more on order today. In addition, I recommended Sittlers to many others including at least two others who have purchased and are satisfied users of Sittlers. Being well built, properly engineered, and designed for the on-farm user (I operate on large dairies of approximately 2000 cows each) this machine is perfect for me. With proper maintenance I expect each machine to operate over ten years (I'm going for thirteen on my oldest machine). I can strongly recommend Sittler machines". Roger S. Wood, Compost West Inc.
"I have a program that is working and am reluctant to change because keeping the golf course in good condition is important. If I didn't think it was working, I would tell you. For divots on the tee boxes, ABC compost is the best product I have ever used, the grass recovers much more quickly than with the 40/60 sand/peat mixture I was using before. " "The fairways and tee boxes on which we used exclusively compost are faring equally well in the first year to the other fairways and tee boxes." "I just want to thank you and let you know that purchasing the Compost turner was the best investment I have ever made. I would definitely recommend your product to anyone in the world. It is a very simple to operate and maintain and I really enjoy using it."